Wondering about a great gift for a man in your life? 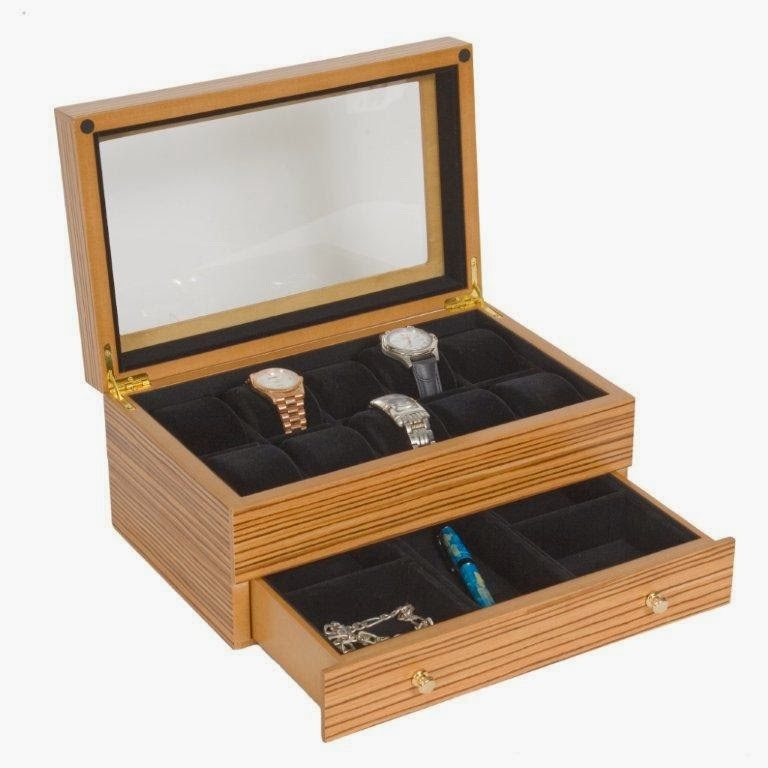 Consider a luxury wooden watch box! Most men have at least two watches: business and casual. And many have quite a few: for business, casual, date night, outdoor adventure, SCUBA diving, flying, a family heirloom, and a high-value watch for very special occasions. Wardrobe-conscience men may have multiple watches to match a specific attire as well. Return policy and warranty periods should be at least 30 days and 1 year, respectively. Color and style are obvious; if your room furniture is modern, traditional, or antique, most wood watch cases will fit in, but, like any item that you will have for years or decades, you’ll want to make sure that it will continue to fit in with changing bedroom styles. Middle grain colors such as cherry fit well with dark or light motifs. Coffee or black work for more modern bedroom designs, and light woods for well-lit rooms do well. Next look at price. The vast majority of wooden watch boxes fall between $100 and $300. With the average dollar spent per Christmas gift item around $200, this gift, while a luxury item, is well within the normal range. Most importantly, the value of a wooden watch box is exceptional. For a man who likes his watches, this gift will last for the rest of his life, and provide excellent protection for his collection. Finally, it provides a great idea for next year: another watch to expand the collection! So whether it holds two or ten, a wooden watch box can be a perfect gift almost any man. These types of cases look terrific on the dresser and all luxury watch boxes have a glass display top to show off the collection, as well as heavily padded sleeves and individual sections to protect against scratching. Many are locking, and a few have gliding drawers in which to place pocket items such as pens and keys. Why wood as the material? For the same reason as wooden hangers: to absorb moisture.